Range voting represents a variety of systems by which a voter may express a partial vote for a candidate, rather than a full vote. Where ranked voting allows a voter to move their vote onto a second choice in search of an electable, preferred candidate, range voting systems require rating candidates. In simplest form, the voter rates their top-ranked candidate as 1 and their lower-ranked candidates as less. Range voting advocates suggest voting is about marginal utility, whereby voters seek to identify the most-useful candidate by rating how “good” they are and then adding up their scores. This contrasts with Condorcet voting, which seeks consensus on an overall-preferred candidate by rank. Due to vote splitting, range voting simplifies to plurality: ratings depend on whether a third candidate appears strong or weak, rather than the marginal utility of a second-choice. In a plurality system, voters elect by casting the most single votes for a candidate. When two desirable candidates exist, they may split the vote and elect a third candidate, as shown below. In modern American elections, voters avoid casting a vote for a third party or even a weak candidate in a primary because they don’t want to throw their vote away. Knowing that Marshall is a strong candidate and Carter is the underdog, voters wishing to avoid electing Dark will vote for Marshall because a vote for Carter is a vote for Dark. Ranked ballots allow voters to rank candidates in order, and so those five Carter voters may rank #1 Carter and #2 Marshall. Because all Carter voters also rank Marshall as preferred over Dark, the race between Marshall and Dark would reflect eleven votes for Marshall and eight for Dark. Marshall gets six votes against Carter’s five. Marshall thus beats Carter and Dark, and is the Condorcet Winner. Without ranked ballots, voters must consider whether the popular candidate can clearly and strongly defeat the unpopular candidate, and whether they are for or against the popular candidate. Generally, the voter must vote for the most-popular candidate they find acceptable or they will weaken their chances. Range voting suffers an almost-identical defect. Consider the above race, where Marshall has a weak advantage over Dark, and Carter acts as a spoiler candidate. As such, Carter voters will want to increase the rating for Marshall, essentially diminishing their vote. By contrast, if Marshall and Carter are expected to come close to one another—say 8.5 and 9—and Dark is expected to lose, then Carter voters will want to rate Marshall lower to avoid electing Marshall when their first choice is Carter. As with simple plurality voting, voters can more-freely vote for a third candidate when the opposition is expected to lose in any case. In such cases—such as where one party has a strong hold and all opposition parties are expected to receive far less than one-third of the vote—the choice often comes down to two candidates, and functions as a vote-for-one plurality vote: the voter’s best strategy is to rate their preferred candidate 1.0 and their lesser candidates as close to 0 as they feel confident in the capacity of the popular candidates to beat the unpopular ones regardless of any vote splitting. Also as with simple plurality voting, voters must essentially sacrifice their third-party vote if they fear vote splitting. When rating a second-choice candidate, they must provide a high rating to avoid vote-splitting, and so increase the likelihood of electing that candidate. Range voting systems behave little different than current plurality systems. In the most extreme cases, systems like STAR voting behave little different than California jungle primaries with instant run-off voting: split voting causes strategic voting, and the plurality winner becomes the majority winner. Ranked voting systems provide voters the confidence in their vote: supporting a second-choice candidate does not harm their first-choice candidate, as an unranked candidate is only another type of lower-ranked candidate. Likewise, casting their first choice for a non-incumbent, non-popular candidate does not throw their vote away, as an utter loss simply moves the whole vote down. Ranked voting systems thus free the voter to seek a consensus vote through Condorcet voting rules, and better reflect the voter’s desires than range voting. Americans routinely voice concern over our election system, including internal threats such as gerrymandering and voting fraud, external threats from foreign interests, and even the design flaws of plurality voting and the Electoral College. These threats open us up to more than just fraud and split votes. Our election process isolates ideological groups for party nomination, and then presents Americans with a choice between these nominees. This excludes the broad consensus of Americans in the nomination process, encouraging extreme views and giving victory to whichever party activates a slim majority of swing voters. 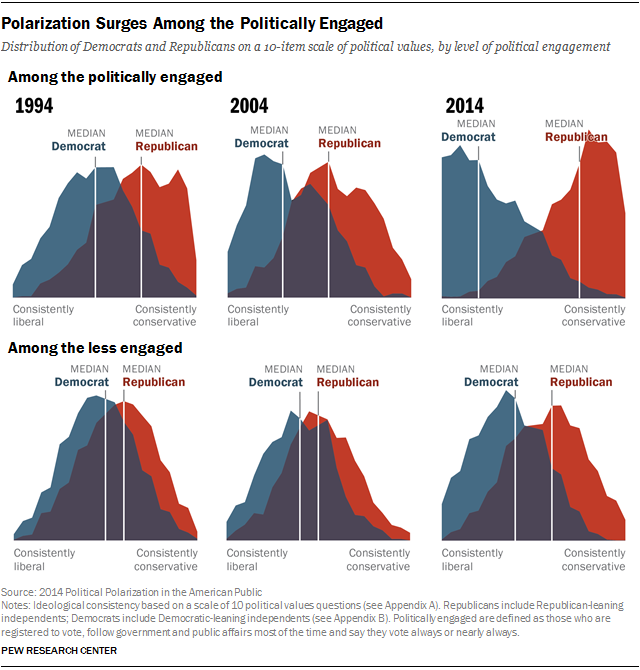 Such polarization robs the American people of consensus, while creating governmental instability: extreme candidates win elections, and so the candidates become more-extreme and power shifts back and forth with disastrous consequences. New administrations tear down the work of old at great cost to our economy and national security, each claiming progress while trampling over the will of half the American people. A more-representative election system resists this pull, bringing victory to those who represent the electorate. Many voting rules can even resist gerrymandering and minimize the impact of voter fraud, foreign influence, and other internal and external attacks. Before we discuss voting systems, we should create a goal for our elections. The United States Federal government and most States have a bicameral legislature, as well as an executive such as the President, Governor, or Mayor. Their purpose and the method of election make an enormous difference in representation. Most States divide their legislatures between the House of Delegates and the State Senate. They elect multiple Delegates and one Senator per each legislative district. By contrast, the States elect single Senators in separate elections at-large, and single Representatives per Congressional district. City and County governments generally elect one member per district to a unicameral legislative body—City or County Council. To provide fair representation, we must treat each of these as having different and very particular function: Houses should represent the diversity of views; while Senates, Councils, and Executives must represent the electorate at large. The House of Delegates should represent the varied needs of the electorate. Each Delegate should represent a block of voters with similar needs to which they more-fully commit than a more-majoritarian representative. Ideally, the United States Congress would also increase representation and require multi-member districts—at least three Representatives per Congressional district—to enable proportional representation. That’s a more-ambitious goal, whereas States only need change their voting rules. Proportional representation strengthens the voice of subgroups of voters, even when mixed into population. Across the district, those voters impact the election in such a way as to select a candidate for themselves, drawing their needs out from the broad geographical body. Both the State legislative bodies and the United States Congress elect fewer Senators. A body of voters has several representatives in the House, and only one Senator to represent them as a whole. City and County Councils are effectively a Senate without a House. City and County Councils, Senators, and the Executive must represent the electorate as a whole, rather than a simple majority. Whereas each Delegate emphasizes the needs of a subset of the district, a Senator represents all of those needs simultaneously. This contrast between the House and Senate allows negotiation between the varied needs in the House along with the general approval of the outcome in the Senate. Coalitions of Delegates where a simple majority holds a strong ideological tilt must pass Senator who individually represent a compromise ideology. Elections must fulfill the above needs by voting rules. Voting rules control how election boards count ballots: plurality, majority, run-off, and more-complex systems such as Condorcet and Smith methods. We must use election methods with ranked ballots to implement what are called Proportional and Condorcet voting rules. These election methods select by consent of the governed: Condorcet voting, especially, determines which single candidate has the greatest support overall. Proportional representation requires a system called Single Transferable Vote, or STV. While actually voting is simple enough, the voting rule—the method of counting—is unfortunately complex. Those rules most-resistant to attack and most-effective at ensuring fair and correct representation carry the greatest complexity. Most implementations compromise in some way, such as by simply using the Scottish method or the Meek transfer. Rather than Schulze STV, one could consider removing the Condorcet Loser instead of the Plurality Loser each round. The effects are questionable. In general, any STV method produces satisfactory results. Unnecessary complexity introduces risk of fraud, and so compromises have merit. Likewise, strong election verification at the early stages allows independent third parties to count the ballots and challenge the outcome with trivial computer implementations. The American People can decide their comfort and press for the finer details. Single Transferable Vote, when electing three or more winners, nearly eliminates the impact of gerrymandering. It works well for Delegates, and would be an asset to Americans with multi-member Congressional districts. Single-winner elections, such as Senate and Executive, should use a Condorcet method such as Schulze or Ranked Pairs. These methods elect from the broadest majority support, essentially selecting a candidate from voter consensus. Condorcet methods generally elect only from the smallest set of candidates who, in one-on-one elections, would gain a majority vote over every candidate not outside the set—called the Smith Set. If the Smith Set contains only one candidate, that candidate is the Condorcet candidate. When a candidate gains the majority vote, that candidate is the Condorcet candidate. As such, elections must provide a span of candidates sufficiently representing the voting base. It makes sense, then, for primary elections to nominate two or three candidates per party via Single Transferable Vote, eliminating the tendency to run two extremes against each other while not exhausting the voter with an enormous number of candidates to research and rank. Electing through STV primary and a Smith-set restricted general—such as Tideman’s Alternative Smith, which resists all kinds of tactical voting and nomination—ensures the winner represents the voting base as a whole, rather than the result of strategic politics, voter base rallying, and party loyalty.